Stephen is NOT Related to fellow Gardner settler Uriah Clapp. Hannah's ancestry is unknown at this time. 1. STEPHEN5 CLAPP (JOSEPH4, NEHEMIAH3, EZRA2, EDWARD1) was born 14 Mar 1777 in Milton MA, and died Jan 1846 in Chester VT. He married HANNAH LEWIS 14 Jun 1798 in Sterling MA. She was born Abt. 1778, and died Aft. 1815.
i. BETSEY6 CLAPP, b. 27 Oct 1798, Gardner MA. 2. ii. ELIZA CLAPP, b. Abt. 1799, Sterling MA; d. 27 Jul 1872, Harvard MA. iii. RACHEL CLAPP, b. 03 Apr 1801, Gardner MA. iv. NANCY CLAPP, b. 16 Apr 1803, Royalston MA. v. HANNAH CLAPP, b. 29 Dec 1805, Royalston MA. 3. vi. MARTHA E CLAPP, b. 11 Oct 1808, Sterling/Royalston MA; d. 21 Apr 1891, Medford MA. 2. ELIZA6 CLAPP (STEPHEN5, JOSEPH4, NEHEMIAH3, EZRA2, EDWARD1) was born Abt. 1799 in Sterling MA, and died 27 Jul 1872 in Harvard MA. She married LEONARD HOLTON 14 Mar 1826 in Chester VT. He was born Abt. 1798 in Wethersfield VT, and died 13 May 1875 in Harvard MA. 4. i. GEORGE PUTNAM7 HOLTON, b. Abt. 1832, Boston MA; d. 29 Aug 1906, Fitchburg MA. 5. ii. MARTHA E HOLTON, b. Abt. 1834, Boston MA; d. 15 Apr 1894, Ayer MA. iii. MARY HOLTON, b. Abt. 1836, MA; d. Aft. 1855. 6. iv. CHARLES HENRY HOLTON, b. 13 May 1838, Boston MA; d. 10 Mar 1912, Acton MA. v. ANNA HOLTON, b. Abt. 1842, MA; d. Aft. 1855.
vi. LEONARD HOLTON, b. Abt. 1849, MA; d. Aft. 1860. 3. MARTHA E6 CLAPP (STEPHEN5, JOSEPH4, NEHEMIAH3, EZRA2, EDWARD1) was born 11 Oct 1808 in Sterling/Royalston MA, and died 21 Apr 1891 in Medford MA. She married HORACE POLAND 16 Dec 1838 in Boston MA. He was born Abt. 1809 in Langdon NH, and died 02 Feb 1877 in Worcester MA. 7. i. MARTHA ANN7 POLAND, b. Abt. 1842, Boston MA; d. 12 Sep 1905, Medford MA. ii. SARAH C POLAND, b. Abt. 1846, MA; d. Aft. 1920; m. WILLIAM W CHRISTIE, 25 Feb 1874, Medford MA; b. Abt. 1841; d. Aft. 1874. 4. GEORGE PUTNAM7 HOLTON (ELIZA6 CLAPP, STEPHEN5, JOSEPH4, NEHEMIAH3, EZRA2, EDWARD1) was born Abt. 1832 in Boston MA, and died 29 Aug 1906 in Fitchburg MA. He married JOSEPHINE BYAM 21 May 1862 in Littleton/Chelmsford MA. She was born Abt. 1841 in Chelmsford MA, and died Aft. 1910.
i. SARAH ELIZA8 HOLTON, b. 13 Apr 1864, Littleton MA; d. Aft. 1910; m. ASAHEL WHEELER, 30 Dec 1909, Boston MA; b. 08 Sep 1839, Ashburnham MA; d. 02 Sep 1911, Fitchburg MA. 5. 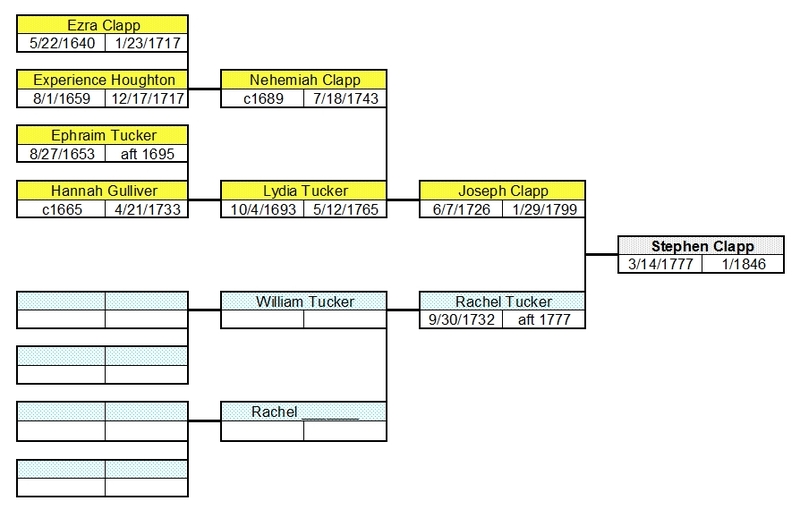 MARTHA E7 HOLTON (ELIZA6 CLAPP, STEPHEN5, JOSEPH4, NEHEMIAH3, EZRA2, EDWARD1) was born Abt. 1834 in Boston MA, and died 15 Apr 1894 in Ayer MA. She married IRA A DWINNELL. He was born Abt. 1823 in VT, and died Aft. 1870.
i. GERTRUDE N8 DWINNELL, b. Abt. 1864, VT; d. 13 Nov 1887, VT.
8. ii. CHARLES P DWINNELL, b. Abt. 1867, Morrisville VT; d. Aft. 1940. 9. iii. IRA GRANT DWINNELL, b. Abt. 1869, Morristown VT; d. Aft. 1940.
iv. MATTIE MAY DWINNELL, b. 28 Jul 1871, Morristown VT.
6. CHARLES HENRY7 HOLTON (ELIZA6 CLAPP, STEPHEN5, JOSEPH4, NEHEMIAH3, EZRA2, EDWARD1) was born 13 May 1838 in Boston MA, and died 10 Mar 1912 in Acton MA. He married (1) NELLIE MARY CARD, daughter of JEREMIAH CARD and LYDIA ?. She was born Abt. 1839 in Providence RI, and died 10 Oct 1868 in Fitchburg MA. He married (2) MARIETTA NANCY TAYLOR 17 Apr 1875 in Harvard MA. She was born 01 Oct 1842 in Boxborough MA, and died 14 Jan 1907 in Acton MA. i. NELLIE ELLSWORTH8 HOLTON, b. 19 Nov 1861, Littleton MA; d. 02 Dec 1902, Acton MA. 10. ii. CHARLES J KIMBALL HOLTON, b. 07 Mar 1864, Littleton MA; d. Aft. 1930.
iii. GEORGE EDWARD POLAND HOLTON, b. 03 Jan 1867, Dudley MA; d. Aft. 1880; m. MARY A ? ; b. Abt. 1878, MA; d. Aft. 1930. 7. MARTHA ANN7 POLAND (MARTHA E6 CLAPP, STEPHEN5, JOSEPH4, NEHEMIAH3, EZRA2, EDWARD1) was born Abt. 1842 in Boston MA, and died 12 Sep 1905 in Medford MA. She married BENJAMIN SUTHARD MARSHALL 21 Sep 1870 in Charlestown MA. He was born Abt. 1843 in Columbia NH, and died 07 May 1876 in Medford MA. i. MATTIE MAY8 MARSHALL, b. 13 Jan 1875, Medford MA; d. Aft. 1930; m. GILBERT CUTTING HALL, 21 Jun 1913, Boston MA; b. Abt. 1878, NH; d. Aft. 1930. 8. CHARLES P8 DWINNELL (MARTHA E7 HOLTON, ELIZA6 CLAPP, STEPHEN5, JOSEPH4, NEHEMIAH3, EZRA2, EDWARD1) was born Abt. 1867 in Morrisville VT, and died Aft. 1940. He married SADIE ISABEL ARMY 18 Apr 1911 in Worcester MA. She was born Abt. 1893 in MA, and died Aft. 1940.
i. HAZEL I9 DWINNELL, b. 30 Apr 1911, Millbury MA; d. Aft. 1930.
ii. CHARLES R DWINNELL, b. 03 Apr 1912, Millbury MA; d. Bef. 1920.
iii. HAROLD GRANT DWINNELL, b. 05 Apr 1913, Millbury MA; d. 30 Jul 1979, Worcester MA. iv. EARL A DWINNELL, b. Abt. 1916, MA; d. Aft. 1930.
v. RICHARD P DWINNELL, b. Abt. 1918, MA; d. Aft. 1940.
vi. MARTHA M DWINNELL, b. Abt. 1920, MA; d. Aft. 1940.
vii. BERNICE M DWINNELL, b. Abt. 1924, MA; d. Aft. 1940.
viii. BARBARA M DWINNELL, b. Abt. 1926, MA; d. Aft. 1940.
ix. ROBERT B DWINNELL, b. Abt. 1930, MA; d. Aft. 1940. 9. IRA GRANT8 DWINNELL (MARTHA E7 HOLTON, ELIZA6 CLAPP, STEPHEN5, JOSEPH4, NEHEMIAH3, EZRA2, EDWARD1) was born Abt. 1869 in Morristown VT, and died Aft. 1940. He married ETHEL A FLETCHER 17 Jun 1902 in Ayer MA. She was born Abt. 1878 in Ayer MA, and died Aft. 1940.
i. MARION9 DWINNELL, b. 17 Oct 1903, Ayer MA; d. Aft. 1930.
ii. REBA DWINNELL, b. 08 May 1909, Ayer MA; d. 13 May 1910, Ayer MA. iii. VIRGINIA G DWINNELL, b. Abt. 1916, MA; d. Aft. 1940; m. WILLIAM ? ; b. Abt. 1914, MA; d. Aft. 1940. 10. CHARLES J KIMBALL8 HOLTON (CHARLES HENRY7, ELIZA6 CLAPP, STEPHEN5, JOSEPH4, NEHEMIAH3, EZRA2, EDWARD1) was born 07 Mar 1864 in Littleton MA, and died Aft. 1930. He married JENNIE ALMA BEAN 22 Feb 1888 in Acton MA. She was born Abt. 1868 in Medford MA, and died Aft. 1930.
i. EDWARD MILTON9 HOLTON, b. 31 Jan 1889, Acton MA; d. Aft. 1940; m. LILLA A ? ; b. Abt. 1891, MA; d. Aft. 1940.
ii. EDITH MAY HOLTON, b. 03 Jan 1891, Acton MA; d. 07 Jul 1891, Acton MA.